For the record, I generally despise tweeting as you watch a movie. It ruins the point of actually watching a movie. 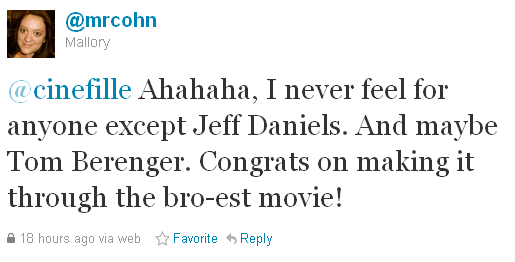 (Though I hate capitalizing movie titles on Twitter more. Are you that excited about BRIDE WARS that you must shout it at me over the internet?) With Gettysburg I broke my live tweeting rule. Gettysburg is a four hour movie and since I knew every essential historical detail, I had to have some fun with it. My mom just came into the room and said to me: "Oh, you're watching Gettysburg. Spoiler alert! The South loses!" Tom Berenger's beard. http://ow.ly/6rjVC That is all. The build up to the final battle scene is great. I want to go around shouting "Virginians!" the rest of the night. Where's my bayonet? @cinefille Love reading this! I've never seen Gettysburg because of these reasons. But now i think i must! Tweet Exchange Of The Night – One last tweet that made my night. I was perplexed by my sudden desire to join the Confederacy at the end of the movie. Also, are you supposed to feel pro-Confederate Army at the end of Gettysburg? Because I kind of do. I blame Martin Sheen's sad eyes. 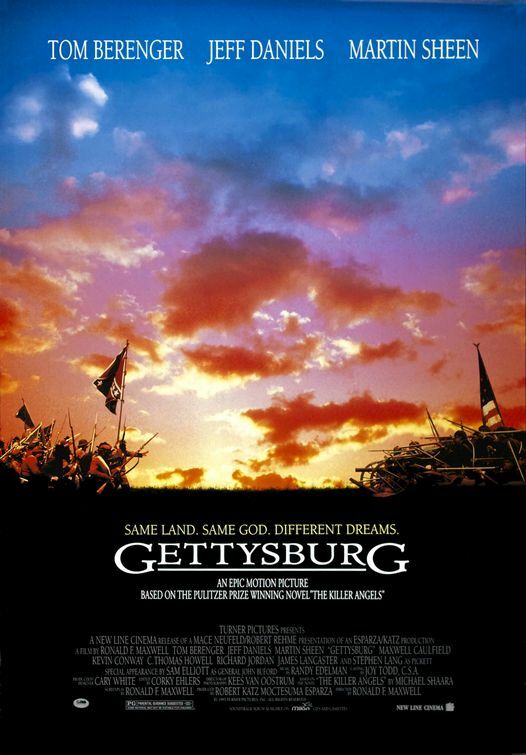 All in all, I found Gettysburg to be entertaining though a bit melodramatic. There were moments I couldn’t stand (the score that never seemed to stop) but I did appreciate Jeff Daniels performance as Joshua Chamberlain, a US Army colonel. But when it comes to the Civil War, I think I’ll stick to PBS documentaries.